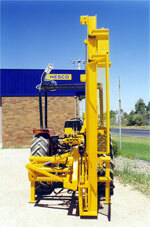 The Hesco Hydraulic Post Driver is a fast effective means of driving various size posts into a wide range of soil types. The post drivers ability to drive posts quickly and accurately is achieved by the size of the hammer list ram and the weight of the hammer. The ram not only lifts quickly, but allows the 230kg hammer to virtually free fall to impart maximum striking force to the post. As this machine sits on the ground any likelihood of damage to the tractor as the hammer strikes the post is eliminated. A safety guard for operator protection is provided. This guard should not be removed under any circumstances while the post driver is in operation, and should always be in place during use. Side Shift A 24" movement is provided by an assembly attached to the tractor 3 point linkage. This assembly in turn has duplicated 3 point linkage mounts to accept the post driver. This allows the basic machine to be converted to side shift at any time by procuring side shift assembly. Hydraulic Height Adjustment is available via a two stage ram. The Bottom section has a 24" stroke which allows the machine to install 9' posts to 3' 6" from ground level. Extention Feet A set of extension feet are available to allow standard machine to accept a 9' post and drive it in to a height of 5' 6" from ground level. Hydraulic Auger Pilot holes may be drilled with this attaachment, which has a choice of three Tungsten tipped auger Diameters. 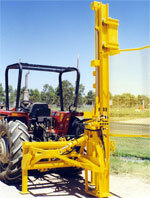 A further option allows the auger to rotate when withdrawing from the hole. Counter weight Attaches to the side shift frame at the oppisite end to the post driver. This helps to stabilise the tractor when working at extreme limit of the side shift.